recruitment 2017. Job Seekers who are waiting for this Tonk dist recruitment jobs have to go through the www.tonk.rajasthan.gov.in. Apply for specific job and submit application through offline mode. Last date to send applications with the copies of mentioned documents is 30th November-2017. Age of the candidates should be between 18 years to 35 years as on 01-11-2017. Pay scale offered for Jr. Technical Assistant Jobs is Rs. 13,000/- and for Accounts Assistant Jobs is Rs. 8000/-. Tonk District Recruitment selection will made on the basis of candidate merit in academic qualifications. For more details of Collector Office, Tonk District, Rajasthan Junior Technical Assistant, Accounts Assistant Recruitment available posts, Age limits, Qualifications related information are given below. 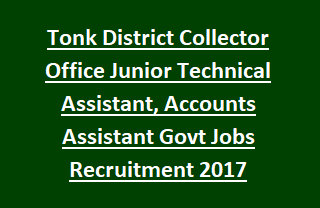 Available vacancies in Collector Office Tonk Recruitment are 24 posts. Jr Technical Assistant: Diploma/ Degree in Civil Engineering or B.E/ B. Tech in Agricultural Engineering from recognized university/Institution. Accounts Assistant: Must have possess CA/ ICWA/ C.S (Inter) or B.Com from recognized University/ Institution. Further details regarding education qualifications see the Tonk Dist Notification. Age of the candidate should be below 35 years and above 18 years as on 01-11-2017. Candidate applying for Tonk District Recruitment Jobs will be selected on the basis of merit performance in academic qualifications. Please go through the notification for full details. Interested candidates must go through the District website of Tonk www.tonk.rajasthan.gov.in. Fill the application after reading the guidelines given in the notification. Application submission for relevant post with respective documents/ Certificates is 30th November-2017. District Programme Coordinator &District Collector, Tonk.